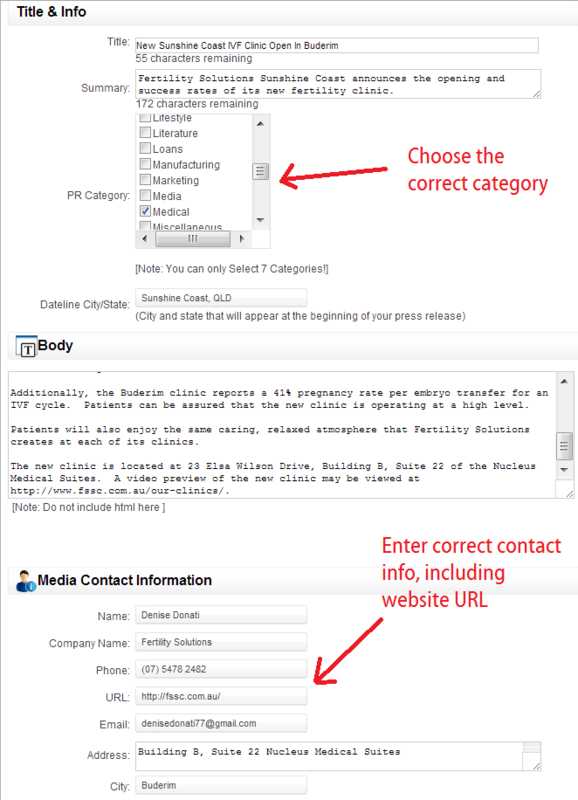 * Quick Start: Sort the list of sites by “Status” and submit your press release to the Winners. 1. Master List Of Free Online Press Release Sites1. Introduction – Help Me Keep This Resource Up To Date! 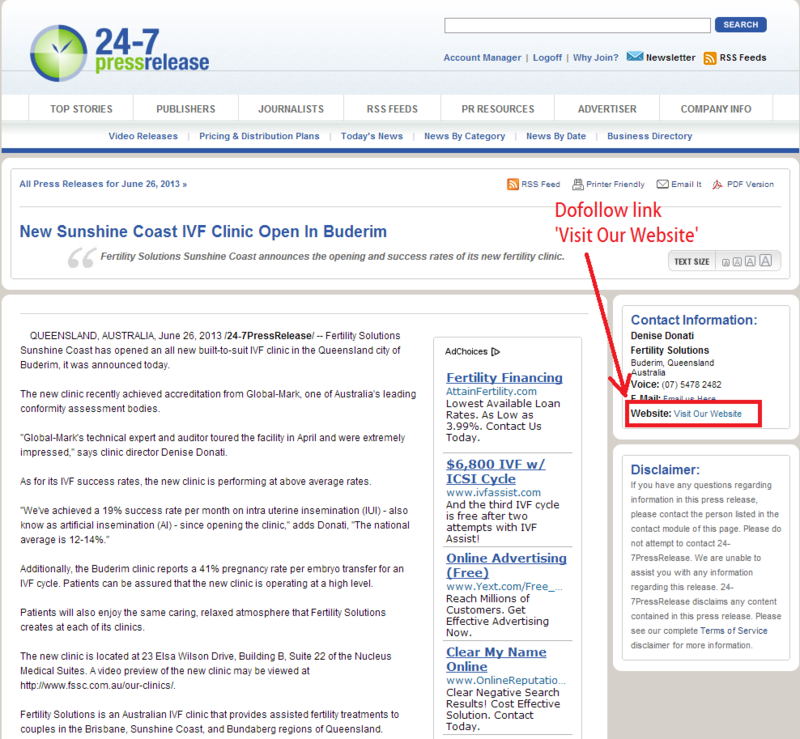 —- Is Your Press Release Indexed In Google? My goal is to provide you with the web’s most comprehensive and reliable list of free press release sites that allow you to get a “dofollow” link pointing back to your website. In short, I wanted to cut out the fat, be more productive, and get great results. Winner = Site provides a free dofollow backlink; learn how to properly submit to it. Loser = Site does not provide a free dofollow link. Testing = Site is being tested. 1888PressRelease.com 4 Loser I submitted two quality press releases in June 2012. Neither was published. I emailed asking why and did not get a response. This site claims to be free, but it's not. Don't waste your time. PR.com 6 Loser Links cost 29.95 each, as of 6-18-13.
eCommWire.com 5 Loser No way to register as of 6-20-13. Live-PR.com 5 Loser German site, submitted release 6-7-13, denied, try resubmit in German. PR-Canada.net 5 Loser Nowhere to login as of 6-19-13. PR-Inside.com 5 Loser Sent text message to Austria 6-7-13 per requirement. Didn't work. BigNews.biz 4 Loser Not accepting new users as of 6-9-13. ClickPress.com 4 Loser Paid releases only $75 as of 6-24-13. Submitted anyway, but it's just "filed". MyNews.in 4 Loser Site shows 404 errors for releases as of 6-22-13. DirectionsMag.com 6 Loser Must be related to geo-spatial technology industry only. PressReleaser.org 6 Loser Release sent 6-6-13 is not live, sent msg 6-9 and got error that 'something went wrong'. Nothing published to site since 5-22-13. TheOpenPress.com 4 Loser Requires 300 words. Fluff it if you wanna try this site. IndiaPRWire.com 5 Testing Submitted 6-21-13, not approved. Re-submitted new release on 2-13-14, only trying again because this is a PR5 site. OpenPR.com 4 Loser Finished entire release and upon hitting "Preview" everything was lost. Another crappy site. AfricaNewsWire.Net 2 Loser Requires payment as of 2-13-14. NewsWireToday.com 5 Loser "Registration restricted" error as of 6-20-13. MyJournalCourier.com 4 Loser No links allowed as of 6-22-13. PR-GB.com 4 Testing Submitted 6-22 using info@, I hit SAVE and it shows unpublished and no longer can edit it. TransWorldNews.com 4 Loser Paid only. Free-Press-Release-Center.info 3 Loser Submitted 6-22-13 and received email from them saying my release is 'awaiting approval' and asking for $2.99 to expedite. MediaSyndicate.com 3 Loser They require payment and you might be able to pay only a penny. I did not want to submit my Paypal information. Bottom line is it's not free, like they claim. PressBooth.org 3 Loser Site is down as of 6-22-13. PressExposure.com 3 Loser Adds nofollow to all links as 6-21-13. PressMethod.com 3 Loser Site does not load. healthprspider.com 2 Loser 2-13-14 Site is not active. LocalNews.biz 2 Loser Site won't load. Only2Press.com 1 Testing Only in bio, anchor text ok.
BooshPLR.com 1 Loser As of February 13, 2014, they are not accepting new registrations. FreePressRelease.com 0 Loser Can't create an account. Don't waste your time. wooeb.com 3 Testing Submitted 6-22 as mikemunterseo, w/ pic, video and URL link. PRWeb.com 7 Loser Paid service. PRBuzz.com 4 Loser Paid service. SBWire.com 5 Testing 6-29 Registered. 1. New Product/Service Launch. If we’ve created or updated a page on the client website to emphasize a new product or service, I’ll write a release and link directly to that page. 2. Generic Company News. If the news is not specific to a product or service, we’ll generally point links back to the home page of the client’s website. Getting dofollow links from a variety of different domains helps the client’s website gradually get stronger. 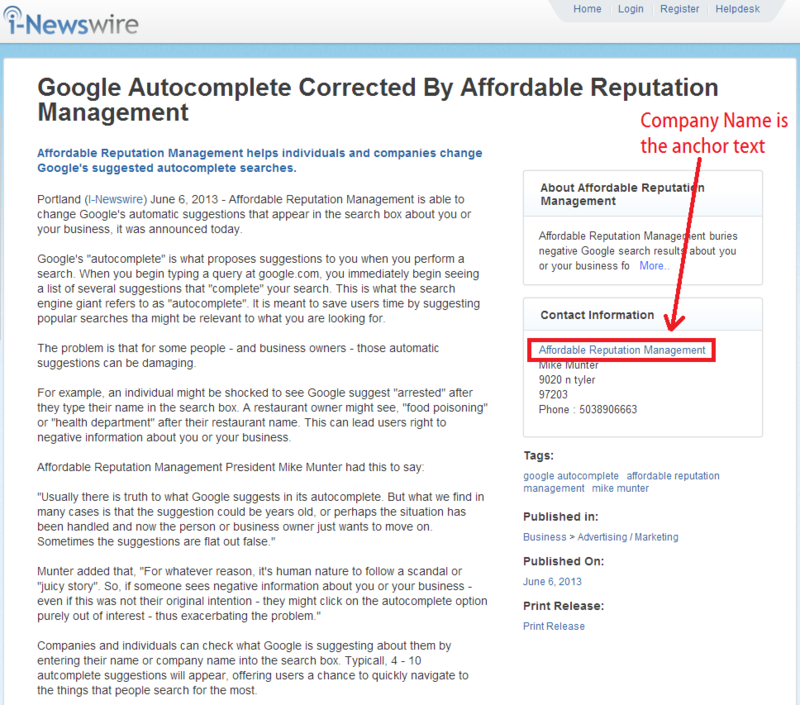 Is Your Press Release Indexed In Google? Just because your release was published doesn’t mean it’s automatically going to get indexed by Google. Many releases get indexed within a week or so, but some take much longer. 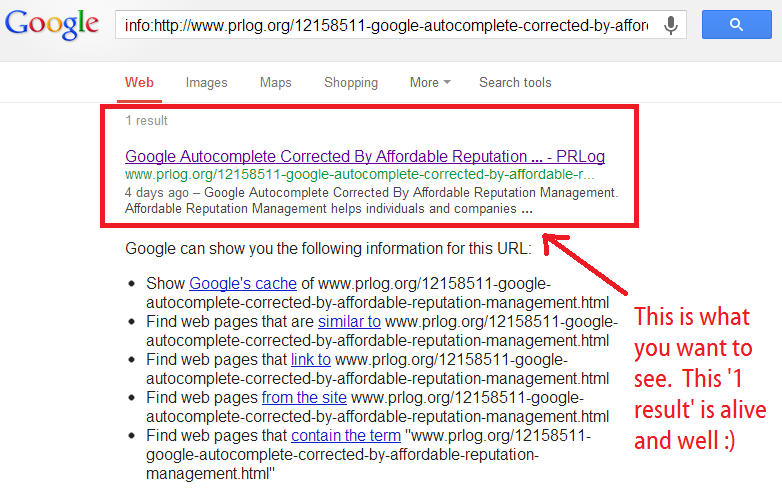 The press release link at right has been approved by PRLog, but Google has not yet added it to it’s index. Until Google becomes aware of the new web page and adds it to the index, it is meaningless. Submit the URL to pingler. Create a link to it from another website (yours). This might be the most effective way to get it indexed. Wait. Most links will eventually get indexed. As you can see, a lot goes into an SEO value from a press release. Description. Re-state the title using the client’s business name. Tease anything else the release might also include. Paragraph 1. Tell what the release is about. Paragraph 2. Make your first point. Paragraph 3. Quote from client, reiterating your first point. Paragraph 4. Make your second point. Paragraph 5. Quote from client, reiterating your second point. Starting to notice a pattern? Paragraph 6. Summarize the release. Paragraph 7. Any additional sentences needed to meet some site’s 250-300 word minimum requirements. Last Sentence. I usually put my URL link within the last sentence. 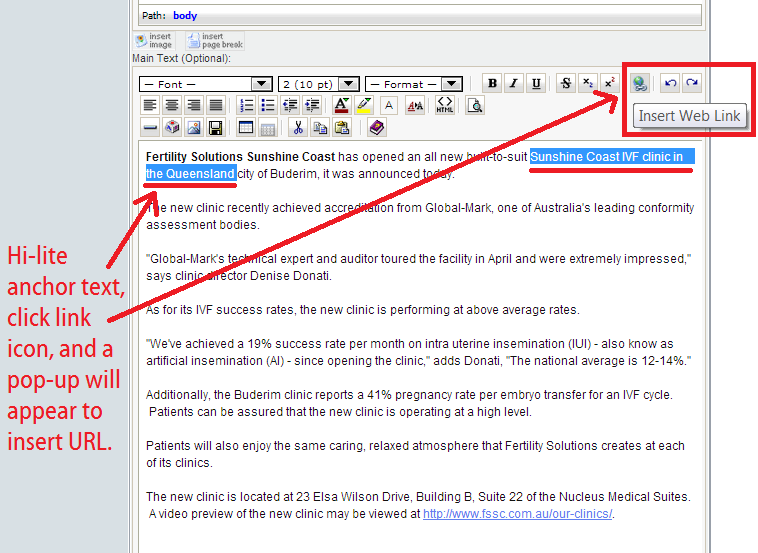 Fertility Solutions Sunshine Coast announces the opening and success rates of its new fertility clinic. 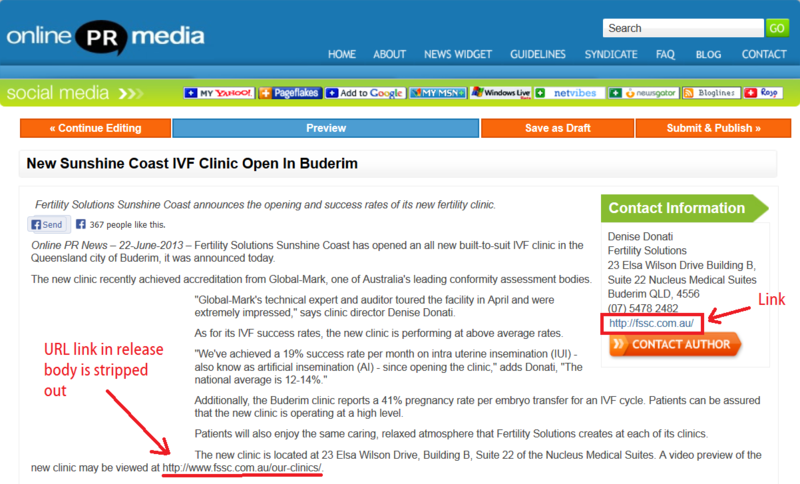 Fertility Solutions Sunshine Coast has opened an all new built-to-suit IVF clinic in the Queensland city of Buderim, it was announced today. The new clinic recently achieved accreditation from Global-Mark, one of Australia’s leading conformity assessment bodies. .
“Global-Mark’s technical expert and auditor toured the facility in April and were extremely impressed,” says clinic director Denise Donati. As for its IVF success rates, the new clinic is performing at above average rates. 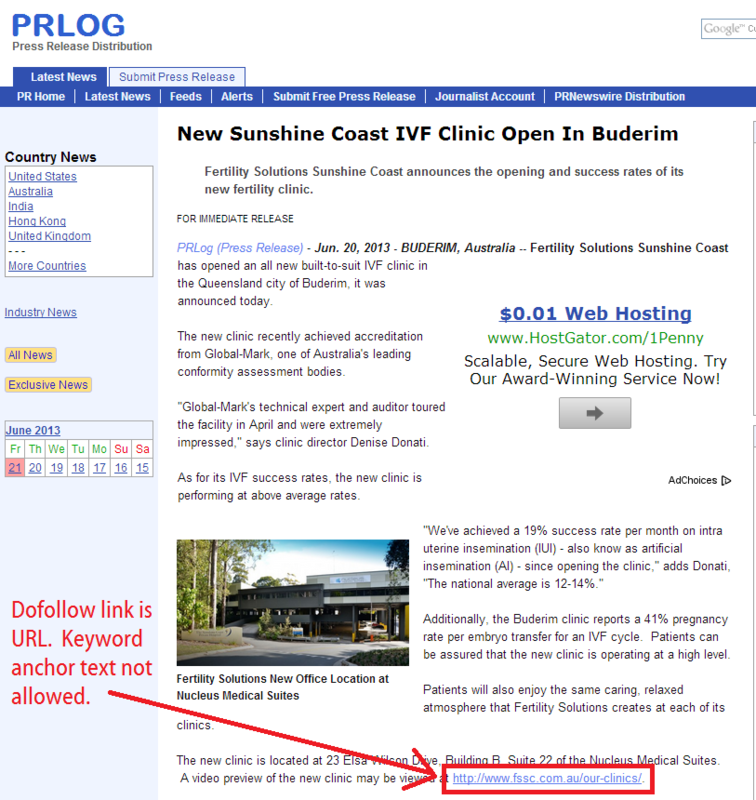 Additionally, the Buderim clinic reports a 41% pregnancy rate per embryo transfer for an IVF cycle. Patients can be assured that the new clinic is operating at a high level. A video preview of the new clinic may be viewed at http://www.fssc.com.au/our-clinics/. Second, create a spreadsheet that contains the following data. You’ll be copying and pasting it over and over. Some sites tell you exactly how to get your link in the published press release and/or author bio. Some don’t. Check your release carefully before submitting and make sure to add HTML coding: <a href=”http://domain.com”>keyword</a> when necessary. I recommend submitting to PRLog first. It’s one of my favorite sites and I’m thankful to my friend, Google Places expert Randy Kirk for telling me about it. You have to sign up with a name@domain.com (no gmail or other free email accounts). 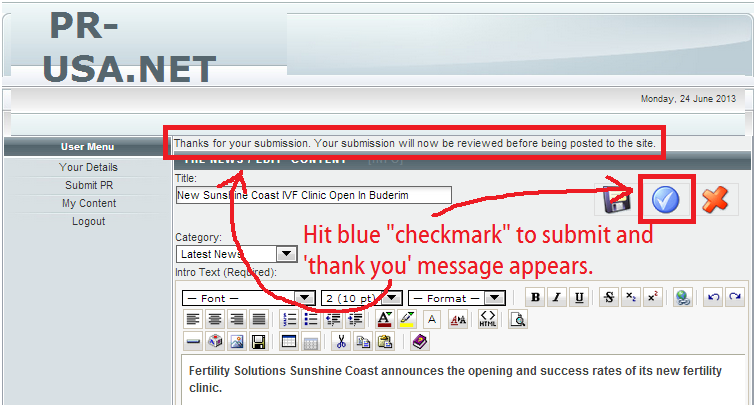 Upload an image, company logo or photo of your client and add a caption. Your link is URL-only; no keyword anchor is allowed. No HTML needed. Check link in Preview mode before submitting. Take advantage of setting up “Press Rooms” for each of your businesses/clients and include their Twitter and Facebook accounts. 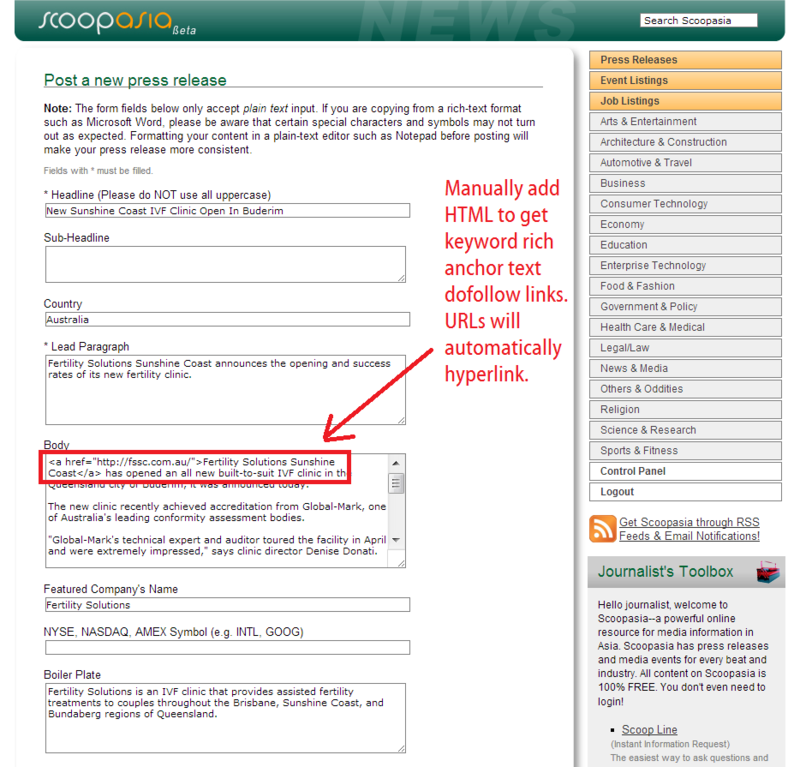 FreePRNow does not allow HTML in the press release body, but it does allow a dofollow link to your company website in the Author Details box. FreePRNow publishes immediately. 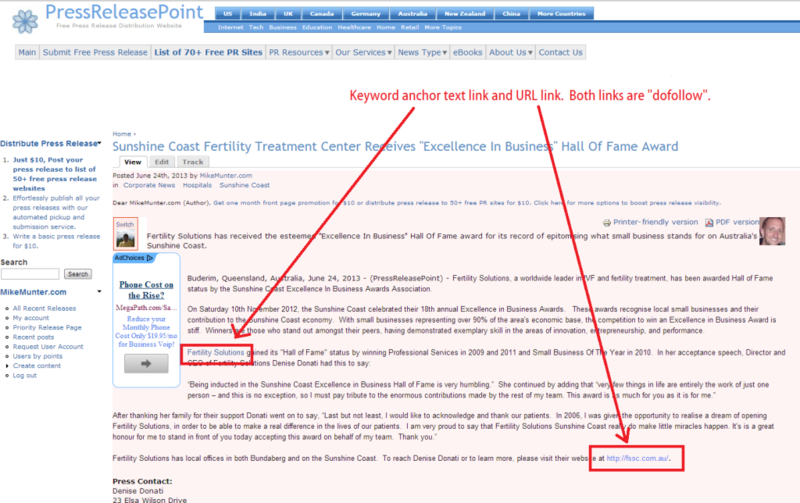 When selecting keyword anchor text, choose the company name or a long phrase like I’ve done in the example at right. Approval is almost immediate – I had to wait a few minutes and refresh my screen. You can also ensure your release is live by checking “My Content” under the User Menu. i-Newswire requires 250 words minimum and all links within the press release body are stripped out. Approval took me less than 24 hours. I-Newswire only allows 1 company profile with a free account, so if you are submitting on behalf of numerous clients, you will need to create a new login/password and profile for each client. This is very important because your dofollow link appears for the company name in the contact information box, which you enter when you setup the profile. Only 1 submission per week is allowed. (I think it’s 1 per client per week). Your press release goes live as soon as you publish. 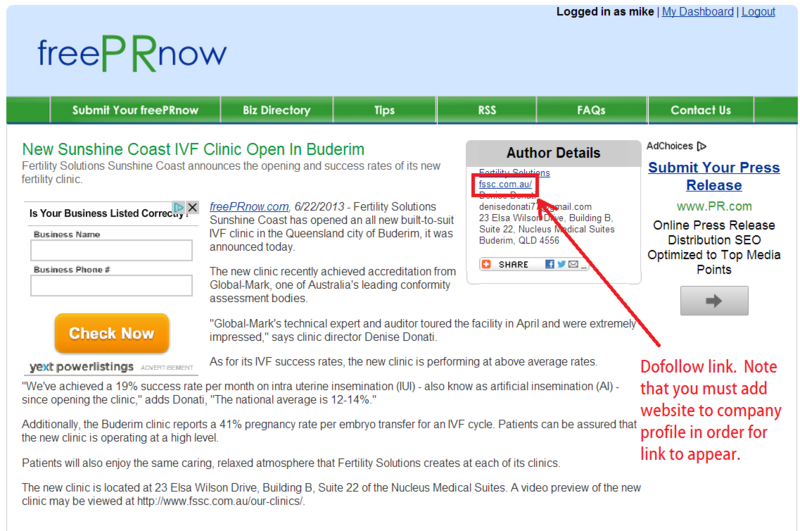 Your link will appear in the Author Details, so make sure you enter the correct URL when you setup each Business Profile. 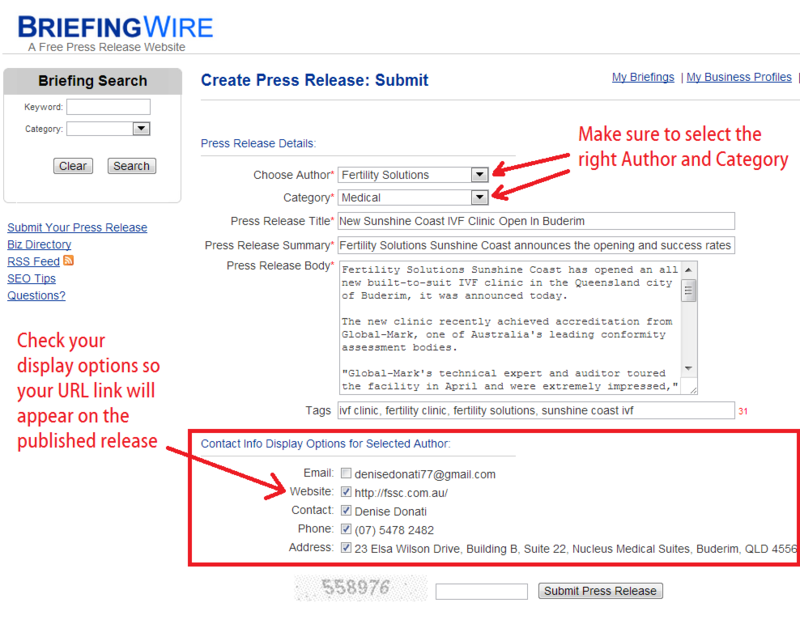 Under “Contact Info Display Options for Selected Author”, be sure to check off “Website” so the published release includes our link. Enter your captcha, hit “Submit” and within several seconds, your release will be published. 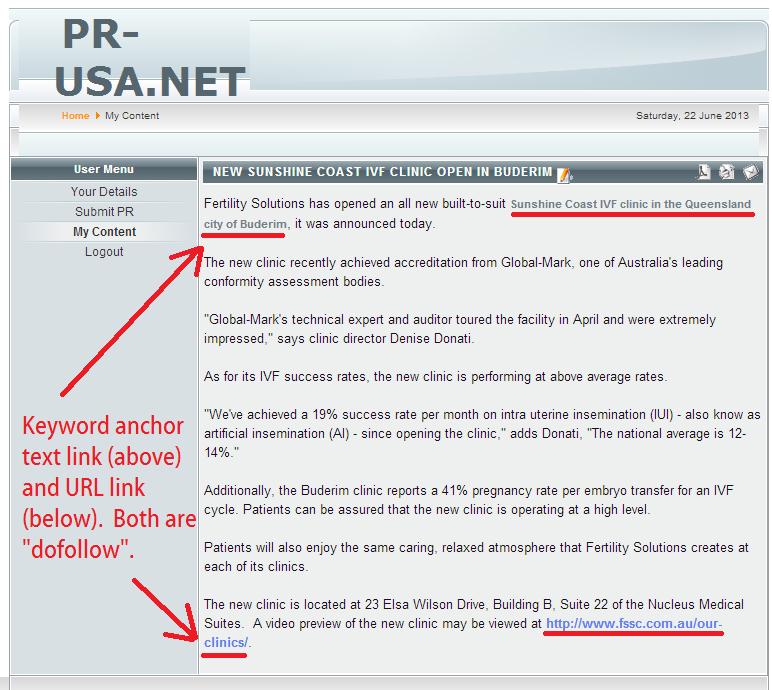 Lately, OnlinePRNews URLs do not work in Chrome (a white box blocks screen view) or Firefox (text can’t be highlighted). I’ve had to copy the URL into Explorer to view it properly on my screen. OnlinePRNews will publish your press release within 24 hours and you are allowed one free press release submission per day. Links in the body of the release are stripped out. Make sure to choose an accurate category. Copy the complete business name, phone, URL, address, etc into the appropriate fields. Your published link is the business URL, so make sure to enter it correctly in the Media Contact Information when you complete the submission form. Only one release submission is allowed per day. We try to focus on Press Release sites with PR3 or higher, but ScoopAsia (PR2) allows keyword anchor text, so I’ve included it as a Winner. Besides, links abound! 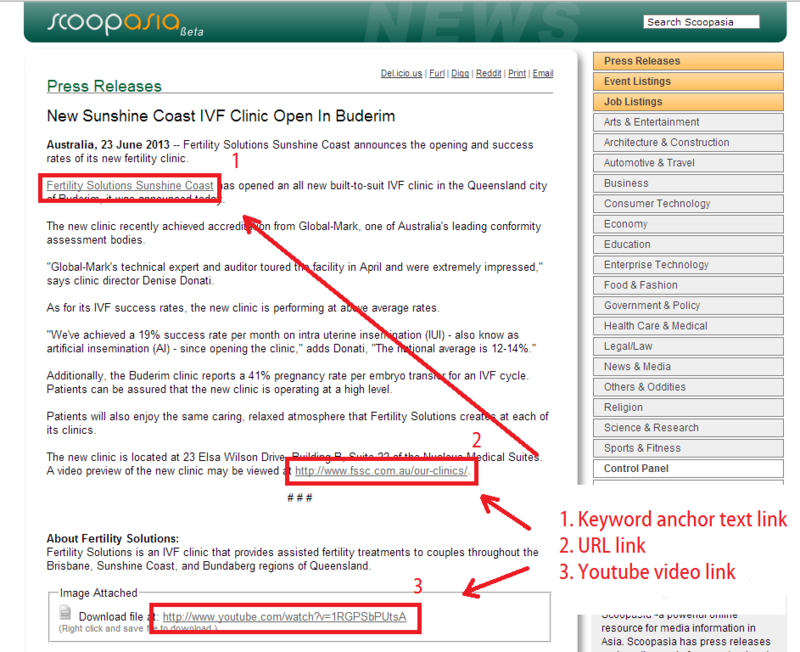 ScoopAsia.com also allows an additional link to an image (I chose to add a relevant Youtube video link in the example). Releases on ScoopAsia are approved immediately, but they can take months to get indexed by Google. Include a link to a relevant image or video if its available. The more complete your submission, the richer the published release will be. PressReleasePoint publishes your release within minutes of submission. 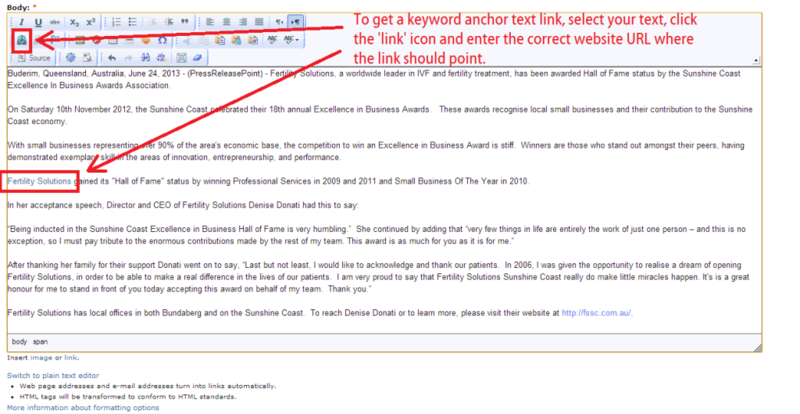 Keyword rich anchor text links are allowed. Be careful not to over-optimize on any one keyword. 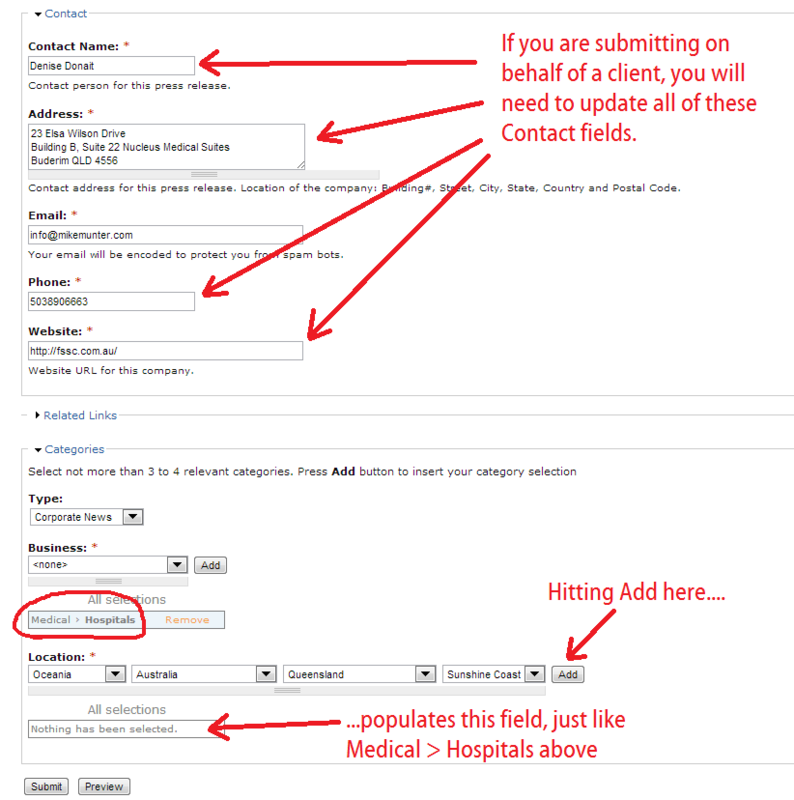 Make sure to update all of the Contact fields with the client contact info. You’ll get a dofollow link for the website under ‘Press Contact’ on the published copy. Company contact first name, last name, company name, address and phone # are all required and make for a professional looking release. Make sure to update these, too, for each client. 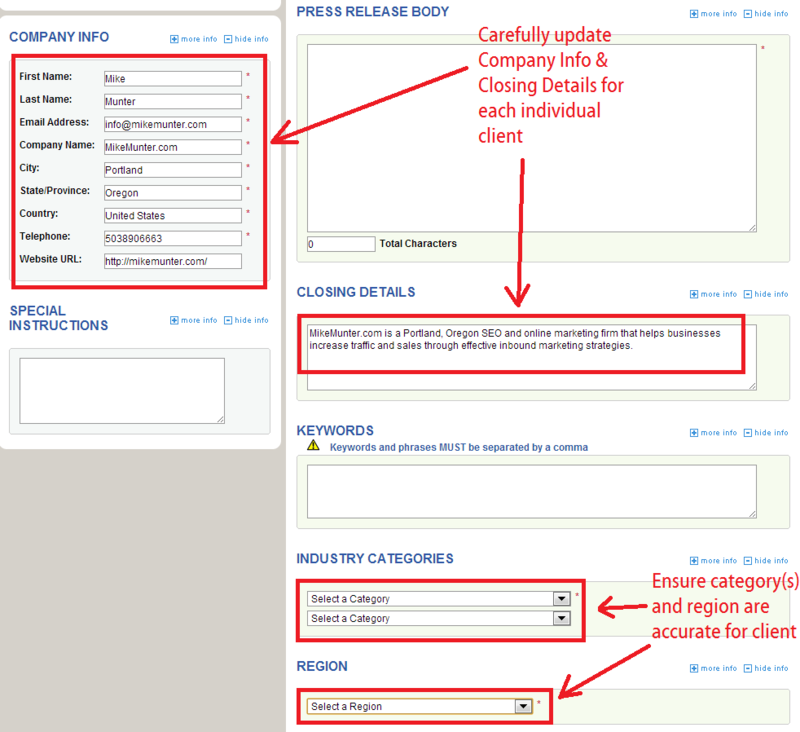 You must also update the “Closing Details” which is a 1-2 sentence bio of the company. Carefully select the most accurate category and region. If you’re a business owner, marketing rep, or fellow online marketer, here are the exact steps I take to write and distribute a press release. Write it. Write release and submit to business owner for approval. Save it. Save approved release, title, and description in a Word document. Gather Data. If I haven’t done it yet, gather all of the bullet points mentioned here and save them to a spreadsheet. Submit It. Assuming I’ve already registered, I’ll submit to PRLog first. Track. Occasionally, I check to make sure releases are getting indexed and give them a boost if they need it. For clients, I try to aim for 1 new press release each month – there is always something new to talk about! Press release distribution and syndication is a regular part of our customized proposals. Contact me here or give me a call at 503-890-6663. I’d love to help you grow your business.